The first operation in the making of these gems of folk art is the cutting out of the cardboard. Then the material is given a coating of warm linseed oil. Each piece of material is sufficient for four articles. It is then cut into pieces. The carefully checked pieces are handed to the joiners. One of the first stages in the making of brooches is turning. 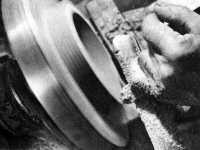 A powder-box is "finished" on a lathe. ...and, finally, "finished" with an emery brush. ...you must be an experienced joiner proficient at working with metal as well. 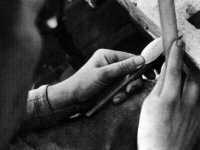 These traditional tools are used by the Palekh masters to prepare primings and undercoats. 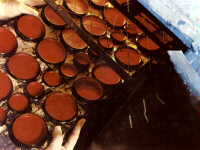 This undercoat of clay, oil and soot is passed through a paint sieve. 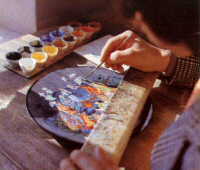 The undercoat is applied to the article with a steel palette knife. It is then smoothed with pumice-stone, the remains of which are brushed off with a goose quill. 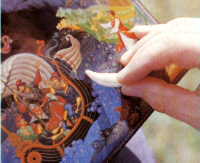 The outside of Palekh articles is painted with black lacquer. The inside is painted with red lacquer. 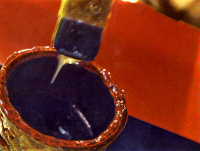 The final operation before painting: about seven coats of transparent oil varnish is applied to the outside and inside of the article. Every coat applied is dried in the furnace for 9 hours at 90�C. The articles are now ready to be handed to the artists. 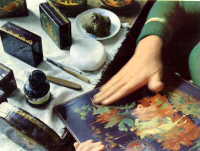 The work of the artist begins with preparation of the paint. In Palekh the paints are mixed with egg emulsion. The yolk, separated from the white, is returned to the shell where a mixture of water and vinegar is added. Then the emulsion is stirred with a special brush.. The egg emulsion is added to the dry pigment and the artist mixes all this with his finger. Before painting the article, the artist draws on the design. ...and the colours are then applied in strict succession. The work of the miniature painter requires not only creative inspiration, but also extreme care and precision which is why Palekh painters frequently make use of a magnifying glass. When the painting is over, the artist begins the gold work. Gold leaf is carefully crushed and then ground by hand. The gold must be polished to give it the necessary shine. This is done with a wolf's tooth, which has a remarkably smooth surface. 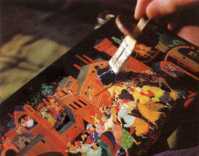 After having signed the article the artist coats it by transparent oil varnish. ...but the "finishing touch" is always a polish by hand. Palekh miniatures are signed on the same pattern. On the cover of a thing there is an ordinal number of a half-finished product, a mark of copyright (C), the place of production (Palekh), date (year), author's autograph. Since 1934 there was put a sign "Made in USSR" outside the bottom of the box, which has been changed into "Made in Russia" since 1992. Everything is done in gold. At the end of the 80th there appeared a trade mark as a "fire-bird" on the Palekh and Co works. The Union of Palekh masters had its own trade mark as a "feather of fire-bird" from 1989 till 1991. But in 1991 it became a "fire-bird" as well. Every organization joins the certificate of work authenticity to the work itself.